The life stages of Z. rumina are discussed by Nardelli (1993; European Z. rumina) as well as Tarrier et al. (1994) and Binagot and Lartigue (1998) (African subspecies africana and tarrieri). Genitalia have been illustrated by Higgins (1975). For the classification of Spanish populations, see Sabariego and Martinez (1991). An extremely rare form, f. honnorati (Type locality: Digne, France) (reconstructed above), although often considered extinct since a hundred years ago, is still protected by law in France (Collins and Morris, 1985; Bernardi, 1991). The last official observation was 1991. Z. rumina is distributed from southeast France (Italy border) to Spain, Portugal, Morocco, Algeria and Tunisia (Higgins and Riley, 1970). The nominal subspecies, Z. rumina rumina (Type locality: S. Europe)(= Z. r. lusitanica Bryk, 1932; Type localty: Portugal) is distributed in southern Spain and Portugal (Higgins and Riley, 1970). In addition to Z. r. medesicaste (Hoffmannsegg, 1803)(= Z. r. australis Esper, 1780; Type locality: ca. Nimes, S. France), other European subspecies are confined to Spain (Sabariego and Martinez, 1991); these include Z. r. castiliana Rühl, 1892 (Type locality: Castilia: S. Ildelfonso, Albarracin, Spain), Z. r. petheri Romei, 1927 (Type locality: Sierra Nevada and Malaga, Spain); Z. r. catalonica De Sagarra, 1930 (Type locality: Catalonia, Spain), Z. r. cantabricae Gomez-Bustillo, 1971 (Type locality: Puerto de Pozazal, Spain), Z. r. isabelae Sabariego and Huertas, 1976 (Type locality: Huelva prov., Spain), and Z. r. transcastiliana Sabariego, 1977 (Type locality: Spain). Most of these subspecies, however, are morphologically very similar and demonstrate great local variation, and of these maybe only 3 or 4 can be considered valid subspecies (Carbonell, unpublished). The majority of the African populations belong to Z. r. africana (Stichel, 1907) (Type locality: Algeria, Morocco) (= Z. r. mauretanica Schultz, 1908; Type locality: north Africa) (Tennent, 1996), although the (morphologically very similar) populations from Anti-Atlas Mountains in north Africa have been described as Z. r. tarrieri Binagot and Lartigue, 1998 (Type locality: Morocco) (Binagot and Lartigue, 1998). The larvae feed on Aristolochia pallida, A. baetica, A. longa, A. fontanesi, A. rotunda, and A. pistolochia (Bryk, 1934; Ackery, 1975; Acquier, 1981; Olivares Villegas et al., 1991; Tennent, 1996; Binagot and Lartigue 1998). A. clematitis, recorded by Bryk (1934) as a larval food plant for Zerynthia rumina, is very toxic and larvae die quickly upon feeding on it (Carbonell, personal observation). Ackery, P.R., 1975. A guide to the genera and species of Parnassiinae (Lepidoptera: Papilionidae). Bull. Br. Mus. Nat. Hist. Ent. 31: 71-105, plates 1-15. Acquier, J.C., 1981. Ponte de Zerynthia polyxena et Zerynthia rumina en captivité. Bulletin de la Societe Sciences Nat 32: 20. Bernardi, G., 1999. Le gene "honnorati" de Zerynthia rumina (L.) a-t-il disparu? (Lepidoptera, Papilionidae). Bull. Soc. Ent. Fr. 104: 419-422. Binagot, J.F., Lartigue, D., 1998. 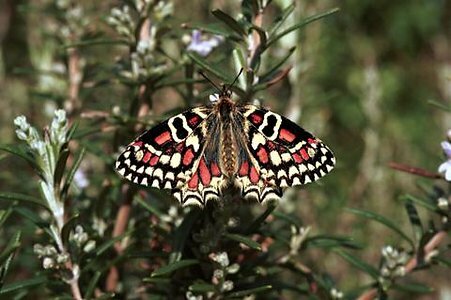 Une nouvelle entité subspécifique de Zerynthia rumina (Linné, 1758) dans le sud-ouest marocain (Lepidoptera Papilionidae). Linneana Belgica 16: 323-334. Bryk, F., 1934. Baroniidae, Teinopalpidae, Parnassiidae, Part.I. Das Tierreich, Deutschen Zoologische Gesellschaft im Auftrag der Preussischen Akademie der Wissensch. Berlin und Lepizig, 64: I-XXIII, 1-131. Collins, N.M., Morris, M.G., 1985. Threatened Swallowtail Butterflies of the World: The IUCN Red data book. Gland, Switzerland. 401 pp. Higgins, L.G., Riley, N.D., 1970. A Field Guide to the Butterflies of Britain and Europe. Boston: Houghton Mifflin, 380 pp. Nardelli, U., 1993. Bemerkungen zur Zucht einiger Zerynthiini und Parnassiini (Lepidoptera: Papilionidae). Entomologische Zeitschrift 103: 213-228. Olivares Villegas, J., Jimenez Gomez, J.L., Yañez, J., 1991. 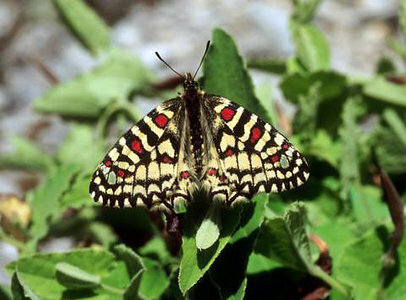 Variations saisonnières de Zerynthia rumina Linné dans le sud de l’Espagne (Lepidoptera: Papilionidae). Linneana Belgica 13: 51-61. Sabariego, E., Martinez, J., 1991. Bionomía y distribución geográphica de Zerynthia rumina (Linnaeus, 1758) en España. Boletín de Sanidad Vegetal, Plagas 17: 465-476. Tarrier, M., Arahou, M., Leestmans, R., 1994. Décoverte de Zerynthia rumina (Linné, 1758) dans l’Anti-Atlas subsaharien marocain et contribution à une meilleure connaissance de l’espèce en Afrique du Nord (Lepidoptera: Papilionidae). Linneana Belgica 14: 427-438. Tennent, J., 1996. The butterflies of Morocco, Algeria and Tunisia. Wallingford: Tennent and Gem Publishing Company, 252 pp., 52 color paltes. Page: Tree of Life Zerynthia rumina (Linnaeus, 1758). Authored by Vazrick Nazari and Frédéric Carbonell. The TEXT of this page is licensed under the Creative Commons Attribution License - Version 3.0. Note that images and other media featured on this page are each governed by their own license, and they may or may not be available for reuse. Click on an image or a media link to access the media data window, which provides the relevant licensing information. For the general terms and conditions of ToL material reuse and redistribution, please see the Tree of Life Copyright Policies.